These reports had 132 characters across, and being able to follow the colors across helped you to keep your place on the report. 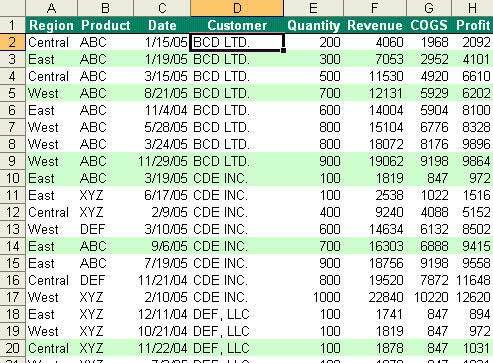 Using Greenbar formatting in Excel has a nice retro look. It is also still easier to follow the lines across the page. This article will discuss three options for applying greenbar formatting to a report. • Start with data in a list format. • Select any cell in the list. • In the AutoFormat dialog, you will see 6 formats. Use the scrollbar to slide down to the third page of formats. Select the format called List2. Click OK.
• Select all the cells in your list. • In the Conditional Format dialog, change the first dropdown from Cell Value Is to Formula Is. • Choose a light green (or light blue or light yellow) pattern. Click OK. The result will be a greenbar effect with every other row highlighted. 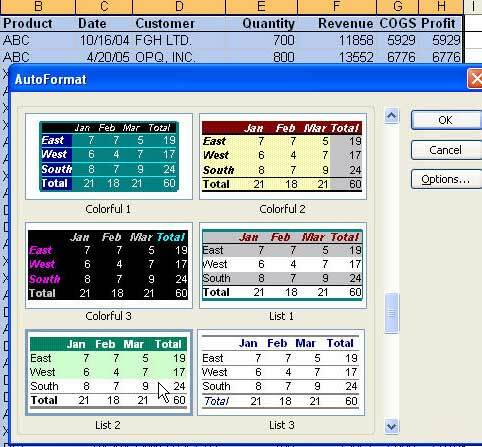 It is created by conditional formatting. You are free to re-sort the data, delete rows or even insert rows in the middle of the data. The greenbar formatting effect will persist. The formula in the Conditional Formatting box uses the MOD function. Do you remember when you were first learning how to do long division? If you had to divide 7 into 25, you might come up with the answer of 3 with a Remainder of 4? The MOD function tells you the remainder after doing the division. So, =MOD(25,7) would be 4 - because the remainder after 7 goes into 25 is 4. In the conditional formatting above, you divided the row number by 2. If the remainder was 0, then it is an even numbered row and the conditional format pattern was applied. The above method fails if you have hidden rows in your data. This is common if you are using an AutoFilter or Group and Outline Mode. Method 2 can not be used if you already have conditional formatting in your data. In this case, the solution is the following macro. If you are not familiar with the Visual Basic Editor, read how to use a macro from the web. In the image below, I've turned on the AutoFilter feature and filtered to just the records for Customer DEF. Select all of the cells in the selection and use Tools > Macro > Macros to run ApplyGreenBarToSelection. The key to this VBA macro is the .SpecialCells method. 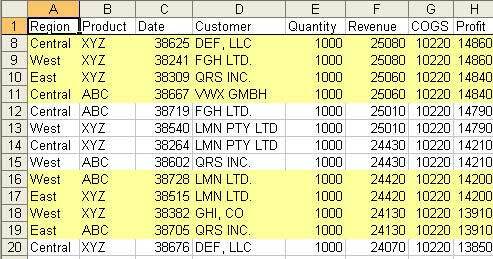 For more macros like this, check out VBA and Macros for Excel written by Tracy Syrstad and Bill Jelen and published by QUE. Bill Jelen is the host of MrExcel.com. 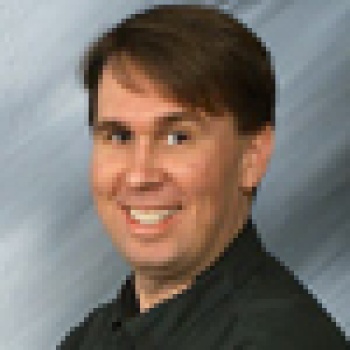 Bill Jelen is known internationally as "Mr. Excel" His MrExcel.com web site contains a searchable knowledge base of over 135,000 Excel questions and answers. He solves 277 Excel mysteries in his newest book, "Learn Excel from Mr Excel". Bill Jelen is the co-author of Pivot Table Data Crunching and 14 other books about Microsoft Excel.